So, home automation is everywhere nowadays; we have smart security for locks, doors. Smart bulbs, intelligent thermostats controlled from a cell phone, you name it, there's probably a smart solution available in the market. Not to mention entertainment: flat screens appearing out of nowhere, smart audio in every room and much more. Every part of the house is being redefined under home automation standards. However, people tend to overlook intelligent Kitchens when discussing home automation. We have created this blog, so you know what could be achieved by a smart kitchen and how to create one. What&apos;s new with smart kitchens? When people decide to add home automation technology to a Kitchen, they usually incorporate smart lighting, AV (audio & video) and that&apos;s about it. Well, right now we have big manufacturers (Sony, Samsung, Apple & Amazon) creating appliances and services with voice control. In addition to it, some of them have teamed up with cooker manufacturers, for instance, Amazon&apos;s Echo can integrate with many of Whirlpool´s appliances, meaning that you can voice control tasks like increasing temperature, turn off the cooker, start the microwave or dishwasher and many more. Overcooked meals, not having the right cooking temperature are no longer issues, we have precision cookers, smart scales and coffee makers that respond to voice control. The best part is that they´re just the tip of the iceberg. Many fantastic solutions for the day to day living. Integration between smart kitchen appliances. In addition to Amazon&apos;s Echo who can be linked to smart home appliances, other manufacturers have created new versions of kitchen appliances, for instance, Samsung has created and launched a smart fridge that responds to voice control, internal cameras and a touchscreen, which comes in very handy for family members to leave messages or reminders. Plus, with the internal cameras, you get total control over fridge contents at all times. Here you can find a cool top ten on smart kitchen appliances for 2018. Now, smart home technology doesn&apos;t stop at kitchen appliances; you can add another home automation elements to your smart kitchen, like lighting. Companies such as Lutron have made a perfect blend of smart home and lighting solutions. You can set up the blinds, so they gradually open throughout the day, providing the ideal amount of light every moment of the day. Actually, we use our kitchens for lots of different activities besides cooking: we read, we make decisions, we watch TV etc., so having the right light can sure provide us with the perfect ambience for any occasion. If you want to have the best control system out there in your own kitchen, make sure you give Lutron a closer look, because they have the right solution for you. 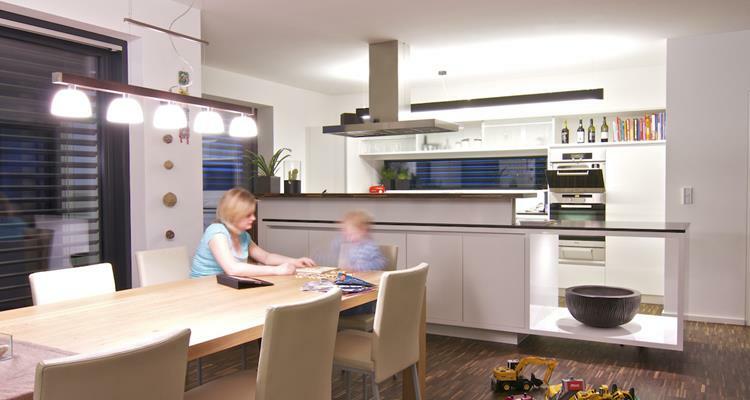 Smart heating is also another perfect solution to add to your kitchen. Having the right light is fantastic, so how cool it would be to have control over the heat source? Many companies have developed smart heating systems that can integrate with any form of heat like thermostats so that they can behave as intelligent devices. You get to choose the perfect temperature for your kitchen while you spend valuable time on it. Adding the "cool" factor to your smart kitchen. At this point, we have covered smart appliances, smart lighting and full integration between such devices and control systems, now let&apos;s bring the entertainment element to the table. 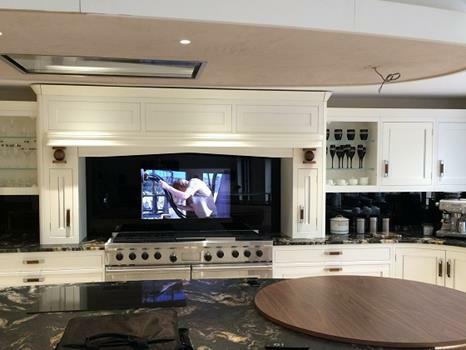 Home Automation can provide solutions for your kitchen allowing you to add Audio & Video to your smart kitchen project without losing the sobriety kitchens should have. Home automation solutions that will enable users to hide TV panels behind pictures, or like Samsung, who just launched the picture panel (yep, it is as cool as it sounds). Going to the living room only to turn the volume up on your stereo, so the music reaches all the way to your kitchen - hence interrupting your cooking - is something from the past. Smart audio entertainment allows you to place voice control intelligent speakers in your kitchen so you can switch between your favourite tunes without interrupting your cooking. Home Automation is taking giant steps every day, more solutions available for every requirement possible, do not hesitate in bringing that element to your kitchen.